The first card and my favorite of the three. Standard A2 sized card (4-1/4" x 5-1'2") I used Mama Elephant's Basic Die set to create the layers of the card. 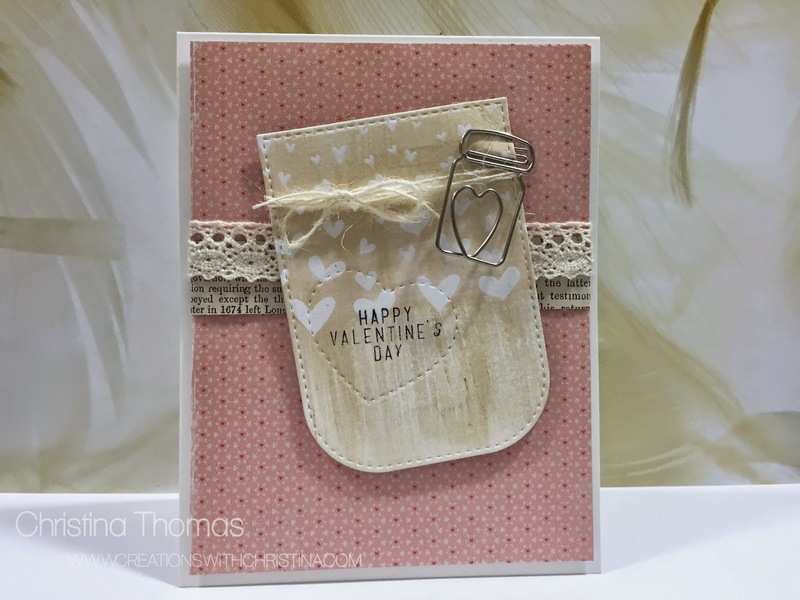 The bottom scalloped layer is die cut with vellum and layered on my card base, the smaller layer using the stitched rectangle die from the set and cut using paper from the kit. Included in the kit was a piece of sticky back canvas. I cut that into a square and then adhered a rub-on (or would that be rubbed on a rub-on?). The hearts and arrow are also die cut using the Mama Elephant Basic's set and cut from the scraps of pattern paper that I used for the smaller stitched layer. Final touch was to add a little sparkle with some Star Dust Stickles. Yep I dragged out my stickles for this one. Standard A2 sized card (4-1/4" x 5-1'2") For this card I die cut the water color paper using my new MFT Tag Builder Blueprints 3 die set and then stamped out the falling hearts using stamps included in the kit. For this I used the clear embossing powder to do a resist technique with the gold Gelatos. The little stitched heart also comes from the MFT set and just leaves a stitched heart impression on the water color paper. I added some twine and the jar paper clip and then adhered that to the background. For the background I added some of the lace I had left out from my banner and then layered that over a piece of the book paper that also came in the kit. A 4-1/4" x 4-1/4" shaker card. Well it's more of a window card with a shaker insert. For this card I used a set of stitched circle die to die cut the pattern paper and then found the center of my card base and die cut the circle again. Using some Pretty Pink Posh Sequins and seed beads I created a shaker window on my card. For the sentiment I used the die cut piece I cut out with the circle die and then stamped out my sentiment using the kit stamps. I then added a few epoxy heart stickers to finish it off. Here's a better photo of the shaker window. I was thinking of bringing back the Stampin' On Friday videos...what do you all think? These cards are so pretty and perfect for Valentine's Day. I've always enjoyed your Stampin' on Friday videos, so yes please, bring them back. Thanks for sharing all your great projects with everyone. I use the 3M Scotch foam tape. I know they have it at Staples and in the framing department at the craft stores. You'll want to get the 1/2" kind. Works great for the shaker cards, but also as a dimensional adhesive for adding dimension. Love your cards! so pretty. Yes please bring back Stampin on Fridays I always learned something from it and love your ideas. Beautiful cards, Christina, but I miss not hearing you on a video about them. They are all so pretty, but I like #2 best of all! I love the Stampin on Friday videos, (sometimes I go back to revisit old ones for some ideas!) so yes, please continue making them. Thank you for all the nice ideas that you share with us. BethAnn M.
Snow heading our way. Not sure if it's heading to Philly this time. We never did get much from that last one. Hugs and stay warm.